Understanding the Domain Name System, or DNS is an important part of understanding web hosting as well as the Internet in general. Without it, we wouldn’t have domains and the Internet would not be what it is today. You may not have known it, but underneath the entire infrastructure, lies DNS. 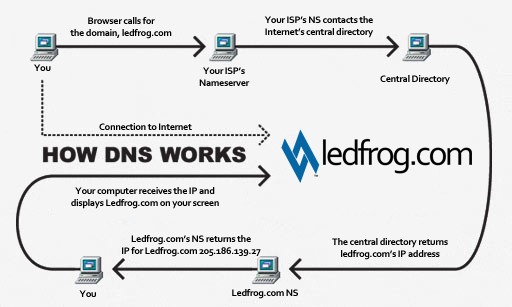 In short, DNS takes domain names such as Ledfrog.com and translates them into an IP address like: 205.186.139.27. Imagine if you had to remember how to find websites based on their IP address? Even if you did, imagine what would happen if that website changed its physical location, thereby changing the IP address? DNS was created to bypass these problems and allow for the creation of what I call aliases that are understandable to humans. Your computer asks your ISP (Verizon, Time Warner, AOL, etc.) if it knows what and where Ledfrog.com is. If your ISP doesn’t know, it asks the Top Level Domain server. In this case it’s .com and of course .com knows that there is an entry for “ledfrog”. It returns the IP address of the server that Ledfrog is located on and tells your computer where to connect. Your web browser then connects to the IP address and you now see the website on your screen. Of course, that’s a very basic look at the process because there are thousands of DNS servers out on the Internet that do search queries to help with the processing of domain names. Once you register your domain name, you need to point it the name servers of the web host you’ve chosen to host your site. As an example, the name servers for my site are: NS1.MEDIATEMPLE.NET and NS2.MEDIATEMPLE.NET because MediaTemple.net hosts my site. Those nameservers are responsible for telling the world that my website is located there and to display it to everyone who asks for it. Another main advantage to DNS is the ability to change your web host at any time. Since the web host isn’t going anywhere, their IP addresses will never change. If your site moves, your nameservers change and therefore get updated with the new IP addresses. Because you have a registered domain name, there’s nothing more you have to do once you update your nameservers.